College stadium and arena productions are more highly produced and heavily marketed than ever before. At the SVG College Sports Summit in Atlanta earlier this month, a trio of athletics departments — each a different size — presented in-depth case studies addressing how they create high-quality in-game content for fans, as well as how they work with their marketing departments to monetize and find sponsorship opportunities for this content. Below are full VOD webinars derived from presentations made at the Summit by the University of Central Florida, University of Minnesota, and the University of Dayton. 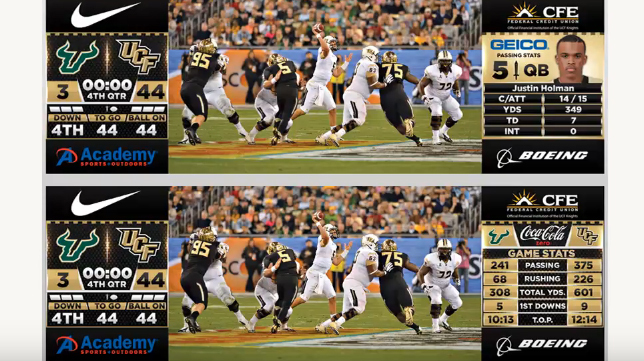 Last fall, the University of Central Florida commissioned and installed 17 LED video displays and two custom audio systems for Bright House Networks Stadium (now Spectrum Stadium) and CFE Arena on campus in Orlando. With new state-of-the-art tech toys at their disposal, the UCF Athletics video team was tasked with creating a wealth of high-quality content to feed these new audio and video systems. Here’s a look at how they prepared for the kickoff of football season (despite an ultra-rapid timeline) and created high-impact experience for Knights fans. The Gopher Digital Productions team at the University of Minnesota works closely with the school’s fan-development department to develop unique elements for the football team’s in-venue experience at the TCF Bank Stadium in Minneapolis. In addition to creating compelling content for fans, the two departments work closely to find sponsorship opportunities in these elements. Here is an inside look at how the Gopher Digital Productions team works year-round to create the best possible content for football game days. The University of Dayton is a great place for basketball. UD Arena packs in raucous Flyers fans for every men’s basketball game (led the A-10 and ranked in the top 25 nationally in attendance last season). Dayton’s Video Services team powers much of that energy with a compelling, high-energy in-venue videoboard show. Here’s an inside look at how it creates content, integrates corporate and sponsored content, and delivers the best possible experience for Flyers fans at the arena.